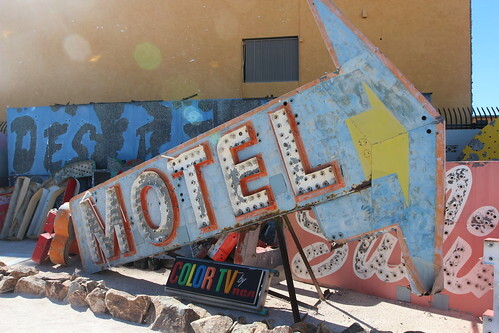 Mali Mish – Downtown Las Vegas, Nevada. The drive is beautiful but not as great as Scenic Byway 12 and 24 through Pangutch and Torrey that we did in 2012. There are no services until we got to the town of Kanab, Utah where we stopped for a late lunch and fuel. Since the National Monuments are now back open, we ate at the Wendy’s right across the parking lot from the Grand Staircase National Monument Visitor Center. Our plan was to eat, and go learn about the area for a bit. Well, apparently our late lunch was much too late. By the time we were done, they had closed for the day. So much for the end of the shutdown. We meandered through Utah with a little dip into Arizona for a part of the drive and eventually made it to St. George, Utah. There we stopped once again for a late dinner at In-N-Out. We could not resist. 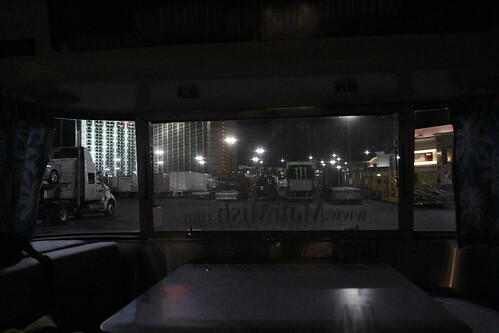 We made the drive all the way to Las Vegas and chose to overnight at the parking lot of the Orleans Hotel and Casino. We have stayed here several times before and this is the most crowded we’ve ever seen. Since we were just here a couple of months ago, we didn’t plan to spend a lot of time here. But one place and people we wanted to visit for sure is our friend Kristiana and her husband Greg at the new Airstream2Go location in downtown Las Vegas. We had heard so much about it and got to see one of their trailers when our friend Mona who manages the Los Angeles location brought one to a rally a few months ago. Seeing the Vegas location is really cool. It is formerly an RV Park so it had all of the RV hookups already in place for their business. They didn’t have their entire fleet here as many of them were rented for a commercial shoot in the desert. 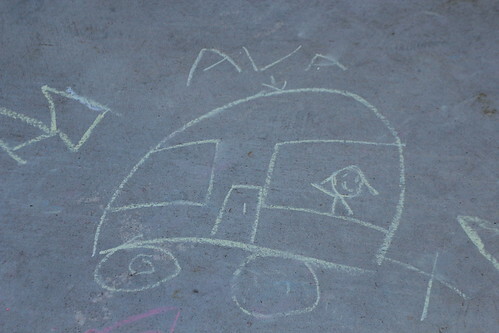 The kids helped Kristiana decorate their concrete pads with some Airstream chalk art. Since some of the trailers were gone, we got to back into one of their spots for the night. 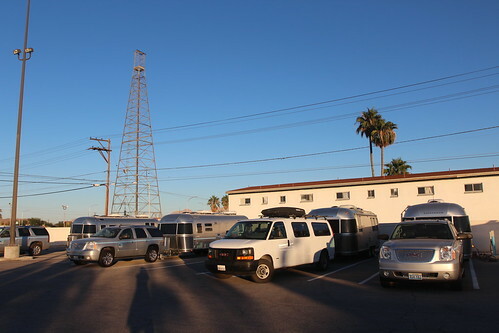 Even though it is a former RV Park, no one actually stays here besides a security guard that patrols the area. It will be nice to have full hookups tonight to take long showers. 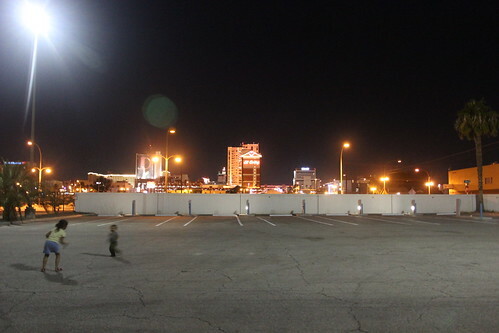 Downtown Las Vegas is currently going through a serious transformation. 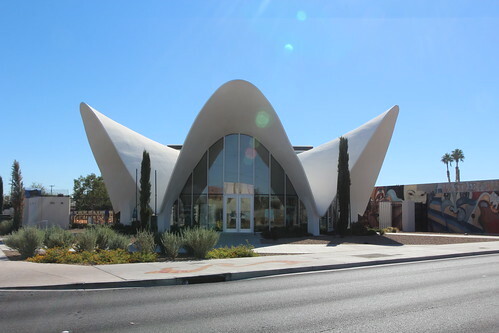 It all started with the founder of Zappos when he wanted to make the area friendlier to his employees. 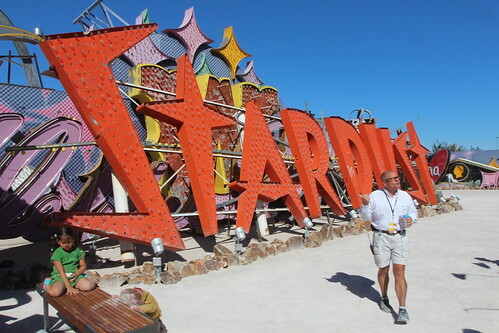 He had a vision of making downtown Las Vegas emcompass the Zappos campus which is nearby. What ended up happening is a complete revitalization of the area. 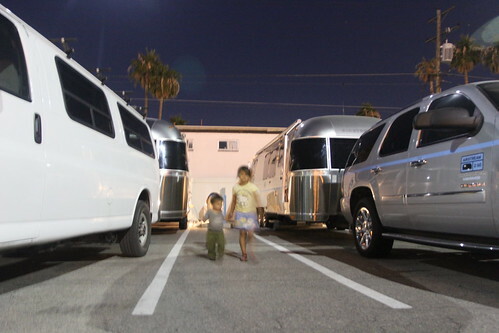 Part of the vision includes an Airstream and Tumbleweed Tiny House Hotel. There was one of each at a community spot called the Learning Center that we got to check out. 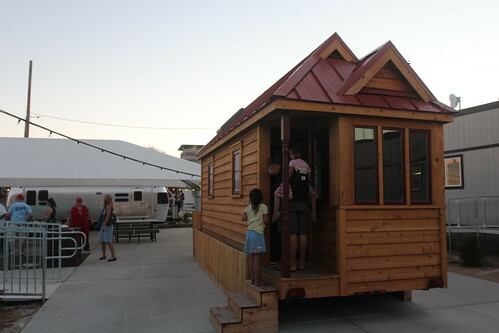 I have always been fascinated with tiny houses and finally getting to see a Tumbleweed, one of the original tiny houses in the movement, was pretty cool. 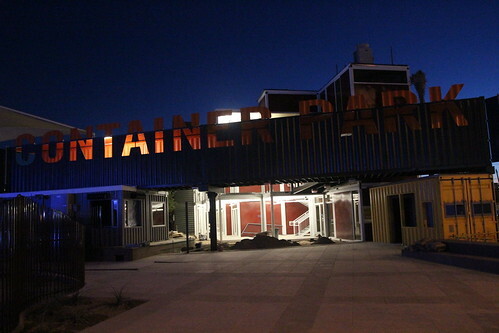 Another focal point of the ‘Downtown Project’ is a shopping area called Container Park. 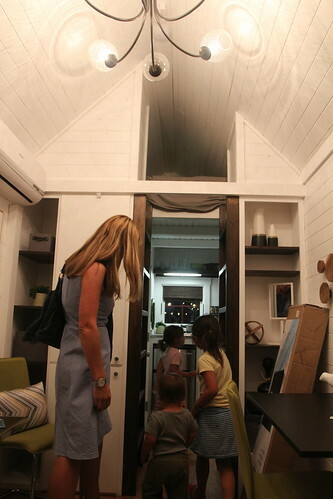 The idea was to build an attractive and efficient space out of mostly shipping containers. 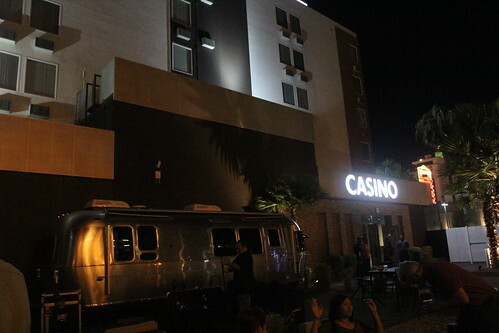 One of the first projects Tony Hsieh of Zappos completed is the Gold Spike Casino. Today, it no longer has any gaming or smoking inside. 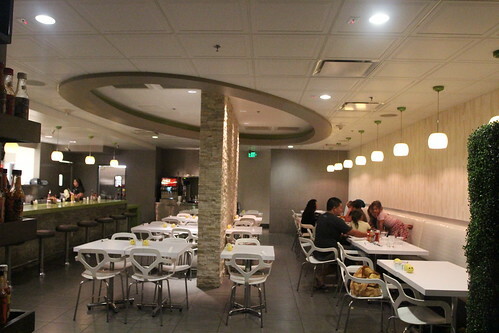 It has been transformed into a hip and trendy hangout spot for Zappos employees. In order to keep their gaming license, they bring in slot machines for just the bare minimum number of hours each year. If you are wanting to play online casino go to Canadian Casino Bonuses at www.EasyMobileCasino.com. It’s actually pretty smart. If you have a gaming license in Las Vegas, you hang on to it. 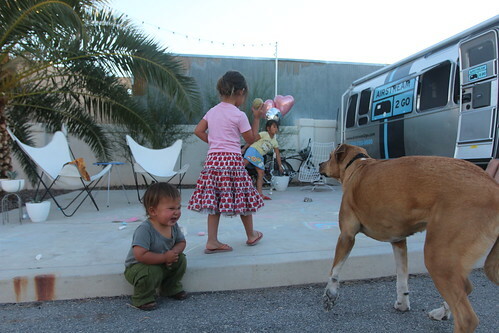 The back patio houses one of Airstream2Go’s trailer. They brought it here while it was being built and is on loan both as decor and a meeting space. As the construction of the back patio is now complete, it now is boxed into this space without a big enough gate to get it out. I guess Tony Hsieh is going to have to buy it. This neighborhood is undergoing some serious transformation. In a couple of years when most of the projects are complete, this will be a very cool place for locals to be. 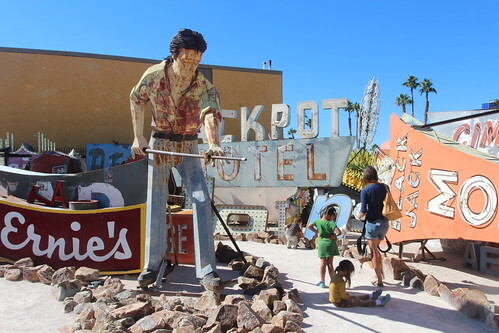 The next morning before we left, we went to visit the Neon Museum just down the road. Since there is really not any places for us to park the Airstream here attached to the van, it was nice that we had a place to keep it for the day. 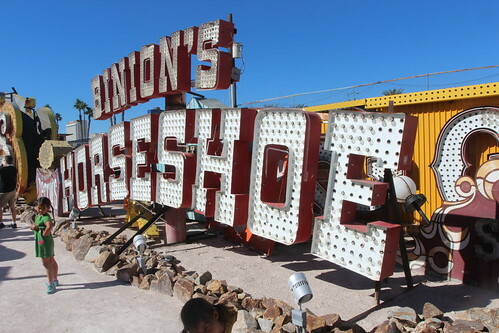 The Neon Museum is relatively new here in downtown Las Vegas. 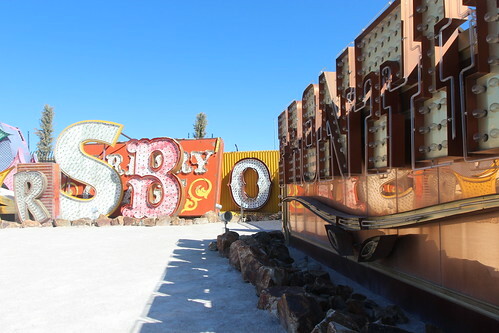 It houses many of the vintage neon signs that use to be at the neon bone yard. The previous bone yard also offered tours but it was not very frequent and tickets were always sold out when we tried to go. Now multiple tours are offered each day and is a must if you are looking for something different to do in Vegas than the Strip. These neon signs were all produced by YESCO, Young Electric Sign Company, which still produce many of the signs today. They were basically leased to the businesses that used them and when they no longer needed it, YESCO took them back and repurposed the parts for newer signs. 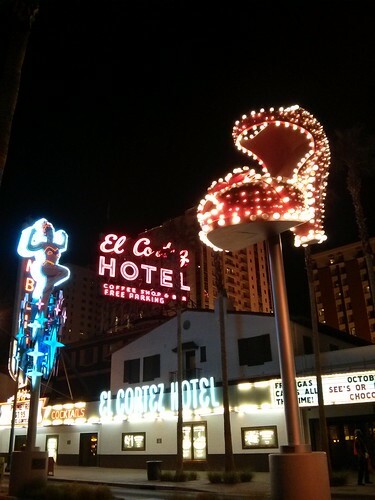 There many vintage and very recognizable signs here that tell the story of classic Las Vegas. The Stardust. 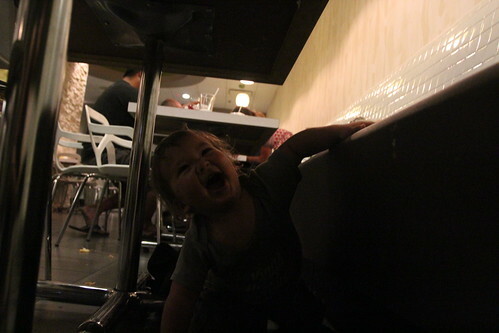 Ava was not quite as enthusiastic about the tour as we were. 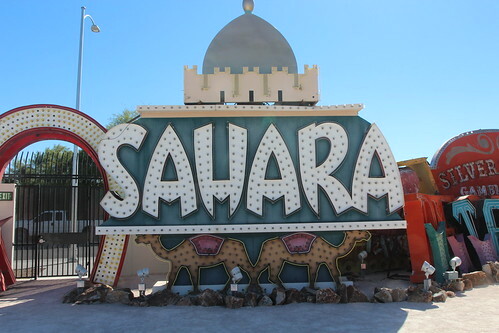 Here is the sign from the Sahara. Come on! It’s the sign from the SAHARA! Here is one from the Frontier. The tour guide was very knowledgeable and told us some very interesting stories about some of the signs. Whether or not they were all true is a whole other thing. 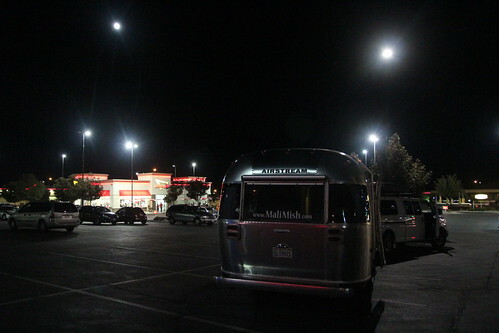 Now it is time for us to go back to Airstream2Go, hitch up and get out of town. 2 Responses to Downtown Las Vegas, Nevada. Your visits leave us with a smile ear to ear. 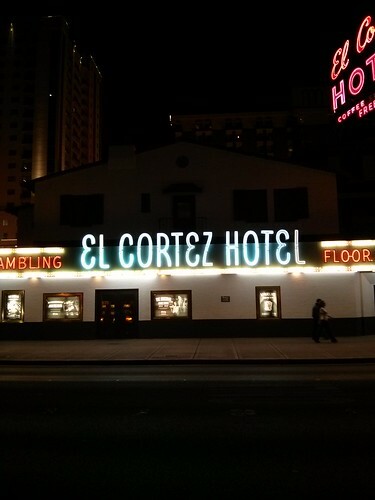 Thank you so much for taking time to check out A2Go and our downtown Vegas neighborhood. You covered a lot of ground and really summarized it beautifully. 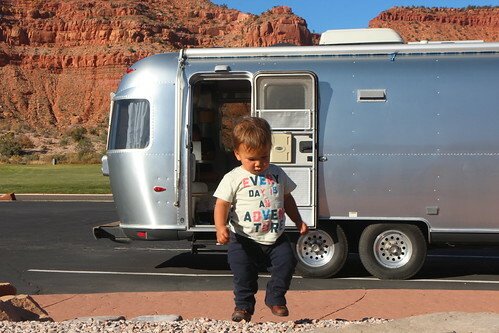 The next time you’re in town, there will be even more to explore – can’t wait for the Airstream Hotel!! Big love to the Mali Mish gang. We love you guys! P.S. 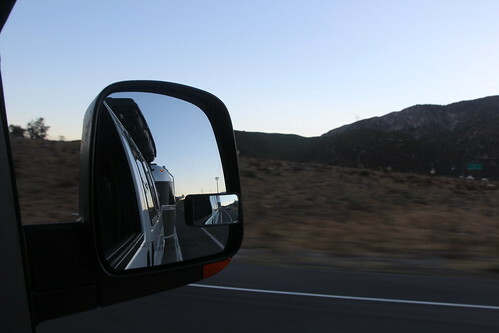 Good news, we got the Airstream from the Gold Spike – hidden gate and some good maneuvering! They have one of their 2014’s in it’s place to continue the backyard bling :). This makes me want to visit Vegas!